First Dark Knight Rises Image Shows Tom Hardy As Bane! The Dark Knight Rises kicked off its viral marketing campaign in a big way this morning with a series of clues posted on the film’s official site TheDarkKnightRises.com. If you go there now, all you’ll see is a blank screen with a bunch of chanting, but smart webfrenzied Batfans have analyzed the sound which leads you through a series of hoops to the first ever image not only from the film, but of the movie’s villain. So who’s this Bane fellow? Odds are he’ll be the primary villain of Dark Knight Rises. He’s a particularly important character in Batman lore, brilliantly smart and epically strong, he’s one of the only villains to ever truly defeat the Bat. He also appeared in Batman & Robin but in a wholly ruined, dumbed down form which transformed the character into a grunting, braindead, brutish henchman. 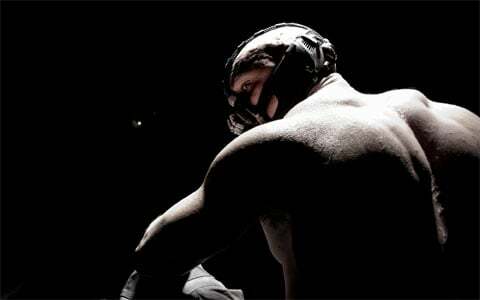 With Tom Hardy playing the character, Bane’s sure to get his due from Christopher Nolan.